The quintessential day dedicated to lovers is almost here, celebrated with roses, gifts, beautiful words, and, of course, with sweets. 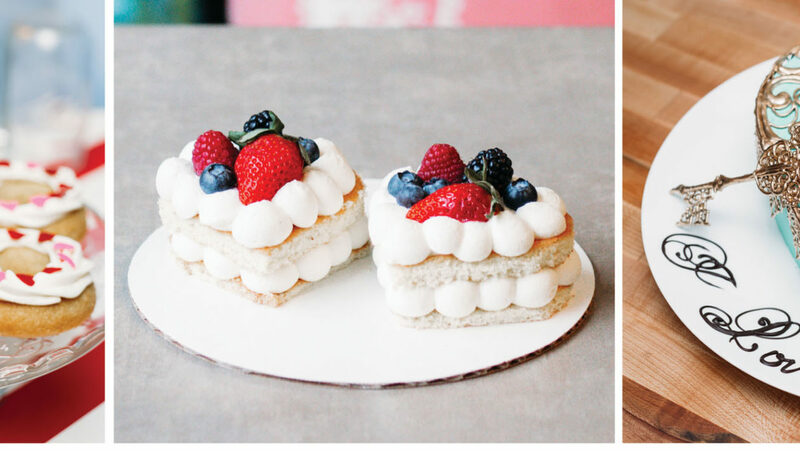 At this time, local pastry chefs are activating their imaginations to create amazing pieces that are out of the norm, eye-catching, and delicious. This month we present some desserts which caught our attention because of their elegance, flavor combinations, and for their commitment to Valentine’s Day. How our chefs approach this ancient Roman holiday is a matter of style and interpretation. For Sophie Hoffer, pastry chef for a 5-star Diamond restaurant in Lancaster, it’s a chance to step up, make something a little extra fancy and over-the-top delicious. Hoffer started baking at a young age. “My Mother taught me to make a chocolate cake using an old family recipe when I was five years old,” says Hoffer. Hoffer graduated in two years and received a degree in business and pastry. Along the way she made cakes for the Pittsburgh Steelers and interned with French chocolatier, Frederick Lorashi. However, she realized that making truffles all day was “not what I wanted to do.” After much soul searching, Hoffer realized that her true passion was pastry making. She continued down the pastry path and her insatiable interest in baking became a full time job. 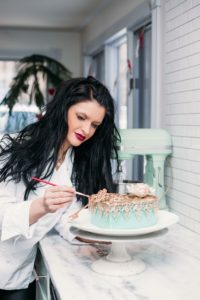 “Cakes are more of my niche,” says Hoffer, who makes over 200 wedding cakes a year as an executive pastry chef. “It’s a lot of cake,” she adds. Looking ahead, Hoffer admits that she has plans to open her own pastry shop one day and already has registered the name: Butterfrost. 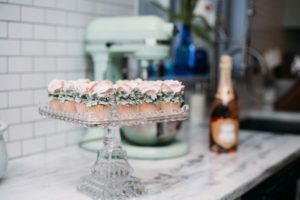 If you are already planning your romantic dinner, but you’re unsure about dessert, Hoffer suggests two signature desserts and offers the recipes so those who might want to prepare these special treats can do so. Hoffer’s choice of desserts are not only fitting for a sweet ending to Valentine’s Day, but for any special occasion where you’re looking to share something sweet. Sift powdered sugar, almond flour, and cocoa through a sifter 3 times. Set aside. Whip egg whites with salt until egg whites begin to froth. Slowly add granulated sugar until stiff peaks begin to form. Fold flour, sugar, cocoa mix into egg white mix in two equal additions. Continue to fold until it reaches a high gloss and loosens in texture. Batter should come off of spatula when lifted out of bowl and should be able to form figure eights with mixture. 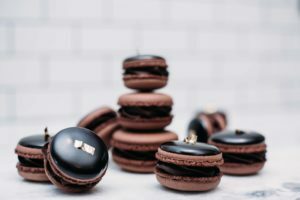 With a large tipped piping bag pipe macaron mixture into quarter sized dollops onto silicone mats or parchment paper placed on a cookie sheet, tap pan on table surface to “know down peaks.” Allow macarons to air dry for 45 minutes to 1 hour prior to baking. Bake at 300º F degrees for 10 to 15 minutes until macarons release from silicone mat or parchment paper. Allow macarons to cool before removing from sheets (Makes 2 dozen macarons). Boil heavy cream in sauce pot and pour over chocolate and instant coffee. Stir to combine until chocolate mixture is melted and shiny. Allow mixture to sit covered over night at room temperature. With whip attachment, whip mixture until it is light and airy in appearance. Pipe onto one macaron shell and top with another. Be very gentle pushing the two sides together as macaron shells are fragile. Beat butter and sugar until very light and fluffy. Slowly beat in egg whites. Add dry ingredients alternatively with champagne. Beat oil into mix and add vanilla and food coloring. Scoop immediately into mini cupcake lined pans and bake 10 to 15 minutes. In a mixing bowl add egg whites. Using an electric mixer with a whipping attachment, whip mixture on high and very slowly sprinkle sugar into egg whites. It is important to continue to beat eggs on high while adding sugar very slowly. Continue to whip eggs and sugar until sugar and egg whites incorporate into each other. Mixture will appear to be shiny and stiff. Slow mixer down to low and add softened butter and vanilla. Beat mixture until incorporated. Turn mixer back up to high. Add spoonfuls of strawberry jam until 8 ounces has been reached. It is important to keep mixing while strawberries incorporate, as the mixture could separate. If butter cream separates keep beating until it comes back together. Frost cupcakes with piping tip of choice. Kristin Messner-Baker’s route to baking pastries for Valentine’s Day was a less traveled path than most pastry chefs. A former attorney and current mother of five, Messner-Baker began making desserts when she opened The Vegetable Hunter, a vegan/vegetarian café and boutique brewery on Second Street in Harrisburg. For Valentine’s Day, Messner-Baker’s café will offer a delicious array of desserts that are vegan and gluten free including her famous pink frosted doughnuts and chocolate peanut butter truffles. Pour maple syrup and coconut cream into a large bowl and stir. Add peanut butter and stir well. Put old fashioned oats in a blender and blend until fine. Add blended oats to peanut butter mixture and stir well until it forms a dough. Roll dough into equal balls and place on a parchment lined baking sheet. The dough should make about 15-20 balls. Transfer balls into freezer for about 10 minutes. In a small sauce pan over medium low heat add chocolate and stir in coconut milk, stirring frequently until chocolate is melted. Reserve a small amount of chocolate to drizzle on truffles. 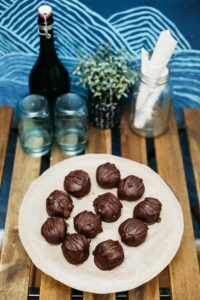 Take the peanut butter balls out of the freeze and dip each one into the chocolate using two teaspoons, letting the excess chocolate drip off before placing each on a parchment lined baking sheet. Repeat until all balls are dipped. Transfer to freezer for 15 minutes. What says “love” more than a vertical cake that seems to defy all cake limits and frosting boundaries? It’s Samra Alic’s Red Berry 7-Layer Cake available in three flavors: blackberry, strawberry and raspberry available from Dalicia Bakery on Third Street in Harrisburg. 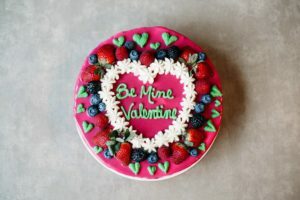 Thin layers of vanilla cake are filled with European cream, fresh fruit and jam and covered with a silky-smooth glaze, topped with more fresh fruit, it’s a Valentine’s Day win-win. Dalicia’s customers can find just about anything in the pâte à choux realm of cream puffs and eclairs that employ that classic, ethereal pastry dough. There’s cupcakes, cookies, French macarons, German strudel, tortes, and cannoli that grace the shop’s shelves. Cupid himself wouldn’t be able to resist anyone of Alic’s irresistible pastries. So treat yourself and the one you love to one or more of the stunning sweets available. You’ll find that Alic’s mouthwatering creations will be a delicious finish to your romantic meal.